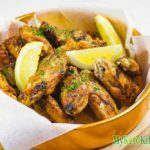 Chicken Wings are a great source of fat for your Ketogenic Diet and there are so many ways to prepare them. Our Keto Chicken Wings are just like fried chicken, without needing a deep fryer. In a mixing bowl, marinate the chicken wings in the garlic powder, salt and pepper and allow to sit aside for 15 minutes. Add the tallow to a large non-stick frying pan and heat over medium to high heat. When the tallow has melted and is very hot, add the wing pieces and fry for 5 minutes. Turn the wing pieces over, place a lid on the pan and fry for another 5 minutes. Remove the lid and turn the wing pieces, cook without the lid for a further 5 minutes. Depending on the size of the wing pieces, they will be ready. To check if they are ready you can cut though one of the larger pieces and check if the flesh is cooked, or use a meat thermometer and ensure the temperature is above 70C/160F. Remove from the pan. Serve with lemon wedges.